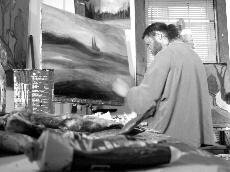 Burlington artist Marc Awodey died suddenly on October 13, 2012 at his home. Marc was born on November 4, 1960 in Ann Arbor, Michigan, and received his BFA from Johnson State College and his MFA from Cranbrook Academy of Art. A modern renaissance man, Marc was an award-winning painter, poet, writer, noted musician, activist, and numismatist. 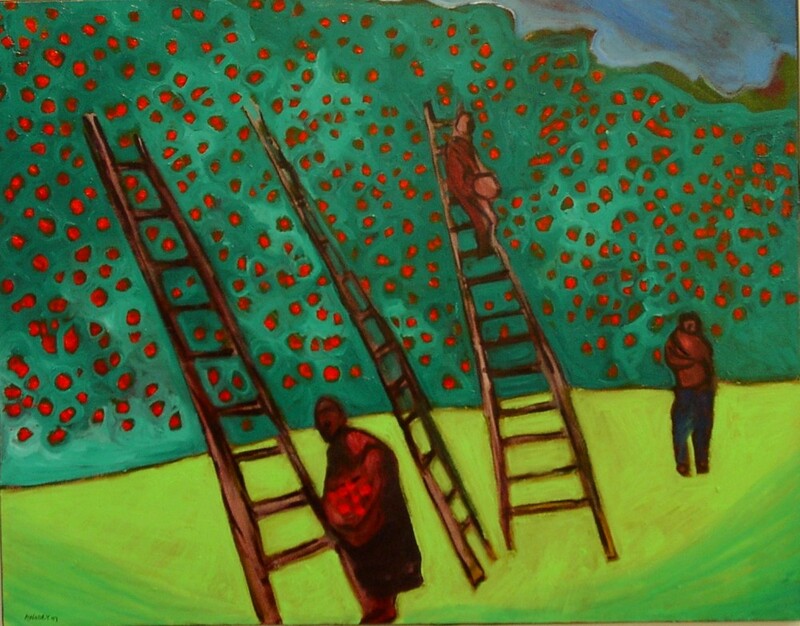 He served on the faculty of Johnson State College, the Community College of Vermont and, for many years, Burlington College, and also taught art at the Massachusetts College of Art and Oakland University. For over a decade he was the resident art critic for the Vermont weekly Seven Days; he also co-founded the online Vermont Art Zine and was the Vermont Regional Editor of Art New England. A characteristic achievement was his winning of the 2000 Haiku Poetry Championship at the National Poetry Slam in Providence, RI, after spontaneously entering the competition unprepared. Marc published several books of original poetry, invented the poetry vending machine, founded and ran the influential Rhombus Gallery in downtown Burlington, and was a long-time fixture in the local music scene as a bassist in several bands. He was also active in Burlington politics, performed many civil unions as Justice of the Peace, and was a member of the Vermont secession movement. But foremost, Marc was a gifted and visionary painter. He had an extraordinary capacity for creating vivid depictions of everyday scenes, drawn from a deep well of creative imagination, producing results that are often both visually striking and intensely personal. His works, many of which depict Vermont scenes in a unique way, are held in public and private collections around the world. In addition to art, he enjoyed politics, games, flea markets, eBay, and the company of his family, friends, and his cat Stella. He had a keen analytic mind, an encyclopedic knowledge of history, and a quick wit, to the constant delight of those around him. His intellect was matched only by his warmth, compassion and generosity. Possessed of an exceptionally sensitive and gentle nature and unassuming demeanor, Marc was equally at home anywhere, if slightly out of place everywhere, and was admired by all who knew him and loved by many. Marc was predeceased by his younger brother Scot, and leaves behind his son Clay and mother Joyce, of Burlington; father William; older brother Steve and family Karin, Myra, Leo, and Klara; and a world of dear friends and comrades. Marc was a truly unique individual, and his loss is deeply, deeply felt. This should be in the New York Times. This is a beautiful obituary. Without Marc’s encouragement as an artist I might not have survived. I am so grateful and remember him always with love, respect, and continued inspiration. Marc was the friend. Beautiful obituary. Marc’s loss will leave a deep hole in the community, not just in art, but his essence the pervaded Burlington and beyond. My blessings to all his family and friends.